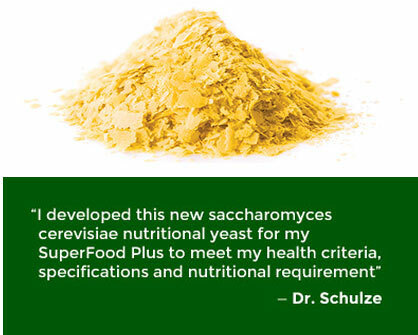 WHAT IS SACCHAROMYCES CEREVISIAE NON-FERMENTABLE NUTRITIONAL YEAST? Nutritional yeasts have a long history as a nutritional supplement. They have been used in Europe for centuries, in both the live and non-active forms for increasing energy, strength, blood quality, blood building and just a great “good for whatever ails you” tonic. My special formulation yeast is not to be confused or mistaken for the very different active yeasts that are used to make breads, beer and wine. I have been using this type of non-fermentable nutritional yeast in my clinic with my patients, and myself, for well over 35 years. It has created tremendous, almost miraculous successes with healing and health building. Finally, I have formulated my own, which is even more bio-available and nutrient-dense, for my new SuperFood Plus. SuperFood Plus to meet my health criteria and specifications, as well as my nutritional requirement. I designed it specifically to nutritionally compliment the other ingredients in my SuperFood Plus. It is grown on an array of organic vegetable matter like beets and corn, and then fed nutrients just like any plant. Actually yeasts are plants, they are micro-plants, which will leech and concentrate the nutrition out of what they are grown on; the same way a vegetable extracts and creates nutrition from the soil. Because they are single-celled plants like algae, yeast also assimilates into your blood in seconds, actually beginning right in your mouth. This is just one of the reasons SuperFood Plus gives you so much energy, so fast. This nutritional yeast is the second highest source of naturally occurring non-isolated pure protein that I know of, naturally occurring at 50%. This makes it the second highest natural source of protein known, second only to spirulina algae (another ingredient in SuperFood Plus). That makes it 200% to 300% higher in protein than USDA Grade-A beef and other animal foods. Also, because it is a single-celled micro-plant, the protein assimilates much easier than meat. In fact, it assimilates in minutes. Like blue-green algae, it is one of the highest known sources of B vitamins, especially Vitamin-B12. This is just one of the reasons that you get such an energy blast from SuperFood Plus, which has in every dose over 550% of your daily Vitamin-B12 requirement. I always say—who doesn’t need more energy! It is one of the richest most concentrated food sources of B vitamins and the B-complex nutrients and contains a powerful mineral base, rich in copper, iron, magnesium, manganese, molybdenum, phosphorus, selenium and zinc along with good amounts of Vitamin-E, RNA and DNA. When we finish making our nutritional yeast, it is heated high enough to absolutely destroy any activity, but not high enough to lessen the B-vitamin content. 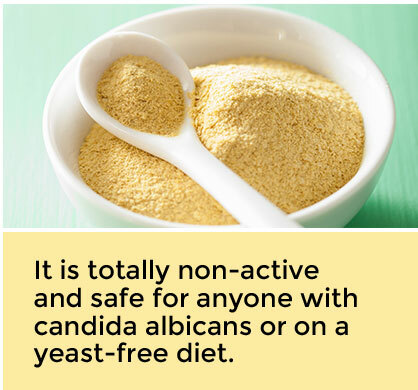 It is totally NON-active and safe for anyone with candida albicans or on a yeast-free diet.